NO SHOW ANYMORE CLOSED !!!!! What is a whirling dervishes ceremony(Sema) ? 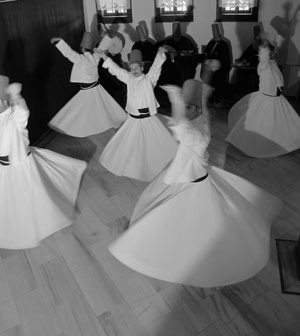 The Whirling Dervish ceremony, called Sema, is a music and dance ritual born out of “love” and “respect” which are the primary ideals propagated by 13th century poet, theologian and Sufi master Mevlana C. Rumi, of Konya, Turkey. Rumi taught that the mere existence of the human being served as an axis point for all of creation and this itself was visible evidence of the Universal Creator. The axis is illustrated through turning or whirling, the most common movement in the Universe from microcosmic organisms likeatoms to macrocosms like planets, solar systems and galaxies; therefore, mirroring this movement is a way to pray or reach Creator. This impressive practice is built on the foundations of aesthetic symbolism, from the details of dervish's dress to the fulfillment of the ceremony. Rumi believed passionately in the power of music, dance and poetry as a path for reaching Creator and since the eighth century, Rumi's teachings have been developed by his followers. His influence resonates still in the schools of thought for teaching tolerance. Sema today reflects this impact, echoing love and respect where you can see, peace is accessed through the arts. Is the modern Sema only a commercial and touristic show ? The Mevlevi sect, Rumi's modern day following, has continued to draw on and develop inspired religious beliefs, literature, dance and music since 13rd century weaving into their lifestyles this once, original way of seeing the world. As the modern tradition progressed, it has weakened primarily due to the lack of resources and community, which in the past were at the foundation, provided by Mevlevihanes or dervish lodges. These Mevlevihanes do privately exist, however our version of the full ceremony is preserved by becoming touristic show which is performed in less than ideal conditions sometimes in commercial venues that aren't necessarily ordained spiritual grounds. In our role, our organization assumes accountability and accepts fully the responsibility to the origins and spirit of the ceremony. Our organization's mission is to present Sema with its all elements intact. Poetry, philosophy, dance and music as a means to share cultural richness. Even if it is seen as a form of religious ceremony, Sema is an art form just like music and dance, and we believe these traditions need to be shared in order to survive. In this way we are part of the process of echoing the resounding love and respect born in the messages of Rumi. What are the differences between this event and the others? The main difference of our event, entitled “800 years of Love” our efforts that we make are at approaching Sufi origins. 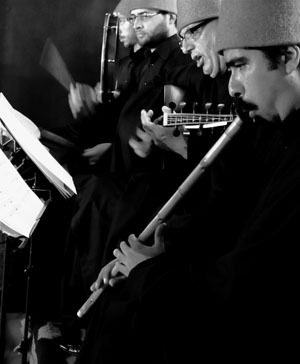 This particular program has been performed by our professional musicians and dervishes in Turkey and abroad over the last 5 years. With the underlying ideals of of respect and love present not only a ceremony that is a body of work combining perfectly performing arts facilities and dervish culture, but we also invite you to feel. Our primary pleasure is a beautiful feeling that resonates in the heart. We invited you also to remember your most powerful feelings and treasure them after leaving our door. If you take notice also of defect or fault, we also kindly ask your forgiveness, and you can be sure that we will work hard to fix it. Why is the ceremony taking place in the House of Dede Efendi? The House of Dervish Dede Efendi is a most suitable place for the spiritual atmosphere of Sema ritual. Some of our most revered Sufi compositions were born in the house of Dede Efendi in the 19th century. Bridging the past and present through his music, our musicians play his legacy, bringing you a unique experience in the center of the city of Istanbul. Dede Efendi house is easy to find if you walk 5 minutes down/South along the coastal road from the Blue Mosque. 800 Years of Love, Dervishes@Dede Efendi House from Hakan HACIBEKIROGLU on Vimeo.